what was I saying :) ? "Great idea" I thought... but seemed like quite a big job and certainly not something I have the time to tackle. 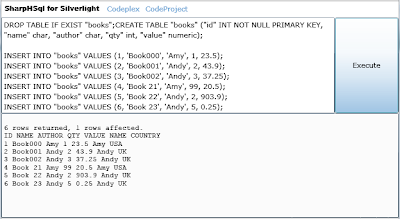 Then I started to recall seeing a C# port of an SQL engine (ages ago) and thought it might be fun to have a poke around. At least it would be easier to port something already in .NET land. A couple of Google results later, I came across Sharp HSql, a circa 2001 port of the Java-based hsqldb (licence). The code was subsequently added to Codeplex with the following warning: This version is not ready for production grade applications. More testing is needed and some important bugs has to be fixed before that. You are warned. 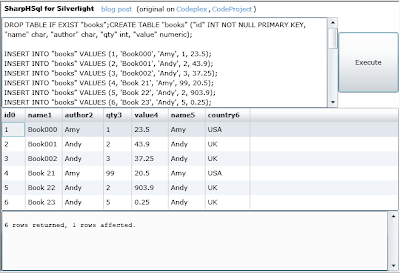 it's a couple of hours later and I've done nothing that I'd planned to, but here is an 'alpha' of SharpHSql for Silverlight (try it out) - there's some test SQL at the bottom of the post. The REAL work was all done by Mark Tutt so don't get the idea that I'm taking any credit - all the goodness is his, any errors are mine. The full source of the consuming Silverlight app is this Page.xaml and Page.xaml.cs; the full Visual Studio 2008 project ZIP (199Kb) is available to download. Anywhere I've touched the code you'll find a //HACK: tag! Disclaimer: I've no idea if this is fit for any purpose at all... it seems to be able to DROP and CREATE tables, INSERT rows and SELECT/JOIN - but even that could be a fluke. Try it out at your own risk; leave a comment if you find something good or bad. Have fun! SELECT * FROM "books" ORDER BY "value"
SELECT * FROM "author" ORDER BY "value"
SELECT * FROM "books" LEFT JOIN "author" ON "author". "name" = "books". "name"
This is a top article! I'll have to check out if Sharp HSql runs on Mono.